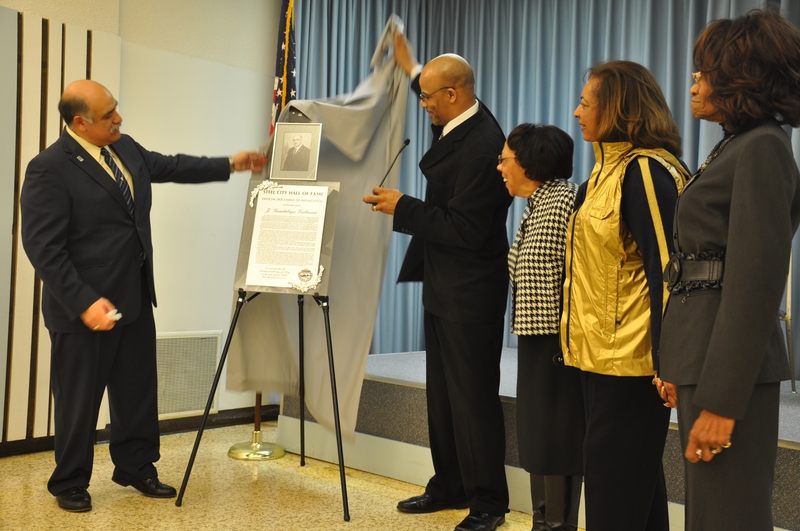 GARY – Family, friends and associates of Ivy Tech Community College Northwest Chancellor J. Guadalupe Valtierra gathered on March 4 at the Gary Public Library, 220 W. 5th Avenue, to witness the enshrinement of the plaque that commemorates Valtierra’s inclusion into the Steel City Hall of Fame. Valtierra was selected for the honor in May 2009 for his contributions to education in Gary and Northwest Indiana. Barbara Cope, former educator and board member of the Steel City Hall of Fame, said she has known Valtierra for quite some time. She remembers his dedication when he was director of the Upward Bound program at Purdue University Calumet. From 1988 to 1995 he worked as the Upward Bound assistant director and then director initiating new programs within northwest Indiana high schools to help students get on a college track. In 1995 he accepted the position of regional dean of student affairs at Ivy Tech Community College Northwest. Valtierra wrote the first educational Talent Search grant for Ivy Tech in 1999. He was selected chancellor of the college in 2002. Under Valtierra’s leadership Ivy Tech has received financial support from the Lumina Foundation to support 21st Century Scholars’ academic preparation and partnerships formed with local industries to create an educated workforce resulting in donations given by U.S. Steel and British Petroleum (BP) for technology training. The Steel City Hall of Fame is a visual display of over forty plaques and photographs that honor individuals “who have spent many years forging successful careers and enriching the lives of others through their volunteer gifts of time, energy, talent and substance.” Permanent enshrinement in the Steel City Hall of Fame is awarded to those individuals (living or deceased), who, while working for twenty-five years or more in a career make broad, significant, and multiple contributions to the Gary community or to society at large.